The CMDR COE resident, NATO LISTED, Disaster Management Course will take place on13-17 MAY 2019. 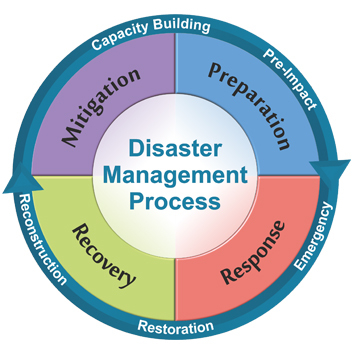 The course aims at building basic knowledge on disasters and on the disaster management process and mechanisms, including on disaster risk management, and on the main disaster management stakeholders. Military officers (OF-2 to OF-5) and/or civilian equivalent, involved in disaster management, assigned to NATO HQs and agencies, NATO Ally and Partner nations′ Ministry of Defence and subordinated HQs; Ministry of Interior, and Ministry of Foreign Affairs; regional and municipal administration, as well as other representatives with responsibilities or special interest in the disaster management domain. - Understand the role of the military in disaster management. The course consists of interactive lectures, practical tasks, case studies, and a final hands-on task. The study method used is premised on the principles of adult learning so as to allow trainees to be actively internalising and processing new knowledge. Formative and summative assessment will be made on in-class activities and will be monitored by dedicated mentors. The command of English language should be at a professional level, according to the criteria stated in STANAG 6001- 3-2-3-2. Equivalent civilian certification will also be accepted. Participants are expected to attend all course activities as the intense programme does not allow for absences during the course. Late arrivals or early departures cannot be accepted. Certificate for successful completion shall not be awarded in case absences are recorded. Mandatory online registration should be completed as soon as possible, but no later than 1 APR 2019. The required minimum for course conduct is 10 participants, and the maximum – 30. Participants are expected to have a valid full medical and other insurance coverage for their stay in Bulgaria. The course fee is € 100, excluding speakers, and participants from the CMDR COE Sponsoring nations – the Hellenic Republic and the Republic of Poland. All incurring costs, such as travel, accommodation and meals, are to be borne by participants. Cancellation of participation is only possible with a 3-week notice prior to the start date of the course. The entire course fee is due past the afore-mentioned period.